Two high-profile Virginia murder cases, in which victims' remains were never found, have some similarities but there is one major difference: a confession. WASHINGTON — Almost four decades before Lloyd Lee Welch pleaded guilty in 2017 to two counts of first-degree murder in the 1975 deaths of Sheila and Katherine Lyon, the disappearance of an 18-year-old Radford University freshman led to Virginia’s first “no body” murder conviction. Even today, prosecutors are often reluctant to try “no body” murder cases. The extra challenge presented by lack of human remains complicates their ability to convince jurors, beyond a reasonable doubt, of a defendant’s guilt. While prosecutors in the Welch case benefited from his admission, the defendant in Virginia’s first-ever “no body” case, Stephen Epperly, maintained — and continues to maintain — his innocence. Almost 40 years after 12-year-old Sheila and 10-year-old Katherine were last spotted at Wheaton Plaza, Welch admitted to leaving the mall with the girls. That confession came in a series of interviews with detectives from Montgomery County, Maryland. “With a lack of physical evidence, the Lyon sisters case would have stayed dormant,” without the breakthrough from Montgomery County detectives, according to Wes Nance, the Bedford County, Virginia prosecutor who convicted Lloyd Lee Welch. Bedford County prosecutors alleged Welch burned at least one of the sisters’ bodies in a fire on the property of his family members on Taylor’s Mountain, in Thaxton, Virginia. During more than eight interviews with Montgomery County detectives, Welch never acknowledged killing the girls, but he is still held responsible for their deaths under a 2017 plea agreement to felony murder. Welch was sentenced to 48 years in a Virginia prison for the Lyon sisters’ murders, and later pleaded guilty to an unrelated series of sexual assaults of a Prince William County, Virginia, girl. He is currently serving time in Delaware for attacking the same girl while she lived in that state. In 1980, prosecutors in Pulaski County, Virginia, in the southwestern corner of the state — without any admission of responsibility from the defendant — succeeded in the commonwealth’s first “no body” murder conviction, only the fourth in U.S. history. On June 28, 1980, Gina Renee Hall went out for a night of dancing at the Blacksburg Marriott Lounge, to celebrate completing her midterm exams at Radford. She met and danced with 28-year-old Stephen Epperly, a former Virginia Tech football player. He left the club with Hall around midnight and drove her, in her car, to a secluded cabin at nearby Claytor Lake. She was never seen again. Peterson said Hall’s 1975 Chevrolet Monte Carlo was found Monday morning, abandoned under a railroad trestle. “Gina was not in the car. The trunk of the car had been left open. Inside the trunk was blood and hair evidence, both of which were matched to Gina’s type,” said Peterson, although it was years after they recovered the evidence before forensic DNA testing became available. Epperly told investigators he had made romantic advances toward Hall, but when she declined, she drove him home and they parted amicably. 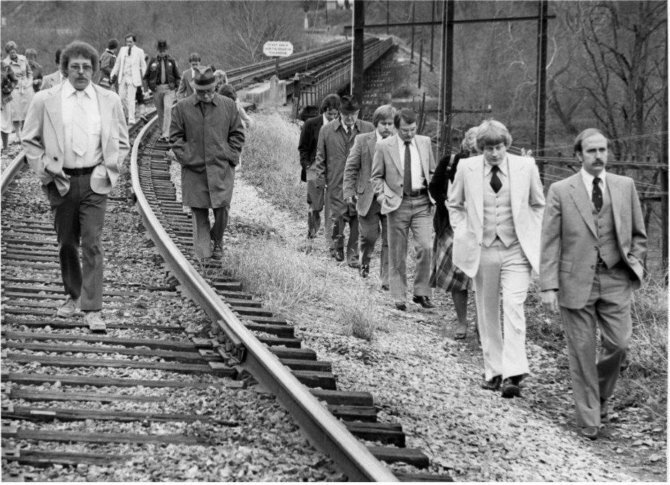 “All the evidence pointed to Stephen Epperly, and everyone involved in the case was convinced of Epperly’s guilt,” said Peterson, who added that ‘everyone’ included Everett Shockley, the Pulaski County Commonwealth’s Attorney. However, all of the evidence against Epperly was circumstantial — evidence that is admissible in court, but which leaves open the possibility of an alternative explanation. “First they’d have to prove she was dead, and then have to prove that Epperly had killed her,” said Peterson. On the strength of circumstantial evidence alone, Shockley risked his career and decided to prosecute Epperly. One of the most compelling witnesses was John Preston and his tracking dog. It was the first time in Virginia’s history that dog tracking evidence was allowed in court. After being scented on a pair of Epperly’s underwear, the dog, named Harass II, led Preston — a retired Pennsylvania State Trooper — and detectives on a search for clues, starting at the spot where Hall’s abandoned car had been located. The jury deliberated two hours before finding Epperly guilty of murdering Hall and recommended a life sentence. Judge R. William Arthur concurred, and ordered Epperly spend the rest of his life in prison. Thirty-eight years later, after several appeals of his conviction, and the U.S. Supreme Court’s declination to hear his case, Epperly has apparently run out of legal avenues. Still, he maintains he didn’t kill Hall. “He has never admitted his guilt and has enthusiastically insisted on his innocence,” said Peterson. Over the years, Peterson said there have been several false alarms in which discovered remains in Pulaski County turned out to be other people or large animals. Recently, investigators dug a site on Radford University campus, where they had reason to believe Hall was buried. “Obviously they did not find her, but they’re continuing to look,” said Peterson.